Paul Mellott Jr. stood in awe as Bob Bartlett, National Stone Association (NSA) president, walked the line and greeted NSA committee members as they arrived for a summer meeting at a hotel in Nashville, Tennessee. The line to check in for this meeting sometime in the mid 1990s probably grew to 30, giving Bartlett the opportunity to spend a few moments with committee members as they waited. As Mellott stood by, he realized Bartlett not only knew each member by name, but he knew the names of members’ spouses and children. “Only he could do this, and you would marvel at how much this guy knew about all of us and how engaging he was to make you feel that he knew all about you and that he was looking out for you,” says Mellott, chairman at Mellott Company and a 2013 Pit & Quarry Hall of Fame inductee. Not only did Bartlett look out for NSA members during his 11-year tenure at the association, but he inspired a number of aggregate stakeholders to work together for the betterment of the industry. Bartlett, who died in 2016, taught the industry to be proactive with the Mine Safety & Health Administration, as well as with departments of transportation at the state and national levels. He also brought more producers into NSA, elevating the collective voice crushed-stone producers projected on Capitol Hill. “He made a big impact with how we learned to get involved in the community and how we learned to make our operations cleaner, safer and more respected,” Mellott says. In addition, Bartlett broadened the association’s base to recruit operations and sales managers, as well as others, into the organization. 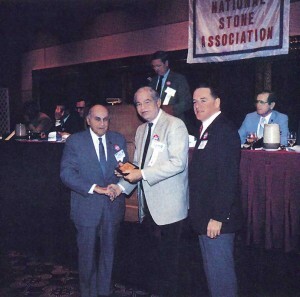 Bob Bartlett, far right, presents an award during a National Stone Association convention in the 1980s. The job Bartlett ultimately earned at NSA in 1986 was a highly coveted position, as 200 applications were received for the opening as president. 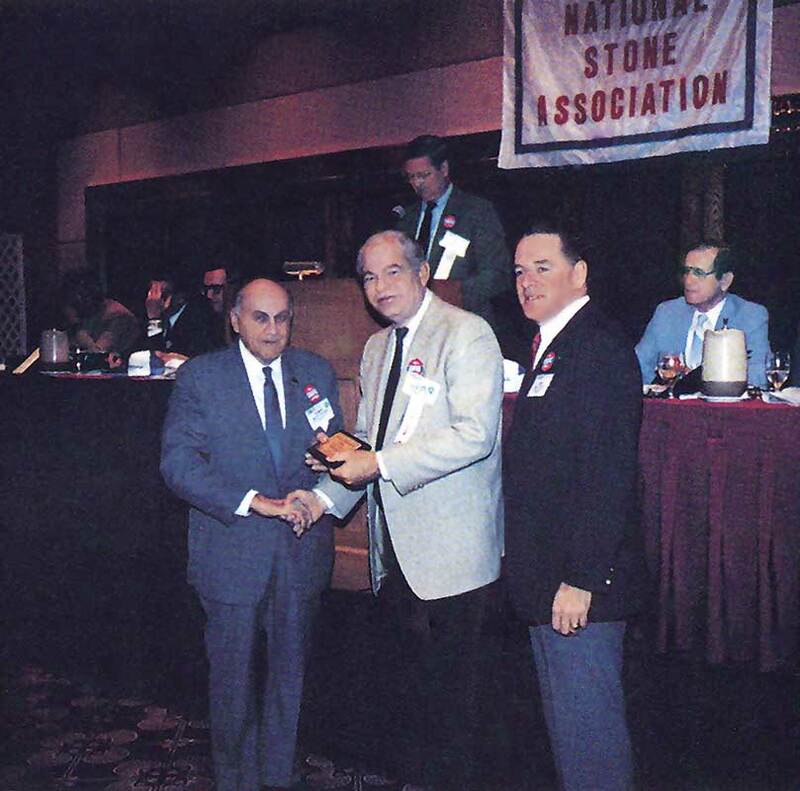 The opening developed following the consolidation in 1985 of the National Crushed Stone Association (NCSA) and the National Limestone Institute (NLI). The combined organization’s co-presidents, Bill Carter and Jim Williams, retired in March 1986, creating a need for a strong voice at the top of the newly formed NSA. Bartlett, who had previously served Pennsylvania as secretary of highways, emerged as that voice, joining NSA following a stop as a vice president at Smithco Leasing Inc. and Keystone Acceptance Corp.
“[Bartlett] is a natural leader, he knows our industry well and we are indeed fortunate to have him on board,” says Fred C. Moore, former NSA chairman, in the July 1986 edition of Pit & Quarry. According to Snyder, Bartlett took the industry to new heights in terms of professionalism during his time at NSA. Bartlett was also the consummate disciplinarian, as George Sidney, the president and COO at McLanahan Corp., recalls. Working for Bartlett wasn’t an easy assignment, though. Bartlett had very high expectations of his staff, Sidney says, but his approach delivered a number of positive results, including a stronger association financially. Praised for doubling the association’s membership, Bartlett also helped to establish a multimillion-dollar endowment through a partnership with the National Aggregates Association (NAA). The Aggregates Foundation for Technology, Research & Education, which NSA and NAA jointly sponsored, established the Center for Aggregates Research. The center offered the industry the opportunity to influence pavement design based on quality aggregate properties. Around the same time, Bartlett developed Stonepac, the political action committee that evolved into the modern-day ROCKPAC. Bartlett also laid some of the very early groundwork for the merger of NSA and NAA. The merger came to fruition a few years after Bartlett’s departure from NSA, although a number of meetings took place during the Bartlett era in an attempt to assess the value of bringing the organizations together. In March 1992, a Pit & Quarry poll found that 84 percent of the magazine’s readers favored an NSA-NAA merger and considered it in the best interest of the industry. But merger talks ended in 1994 despite years of effort on the parts of Bartlett and others. Although the NSA-NAA merger is not directly credited to Bartlett, the addition and expansion of NSA awards is largely a credit to his efforts. 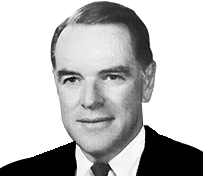 According to Bernie Grove, an aggregate producer who worked alongside Bartlett as NSA chairman and in other capacities, Bartlett saw value in recognizing operations and individuals who excelled in safety, the environment and other areas. “Bob was very strong on safety in the industry, which, at one time, had a very poor safety record,” says Grove, who was enshrined in the Pit & Quarry Hall of Fame in 2014. Bartlett also steered the industry through the 1990s, a decade Grove reflects on as especially challenging economically for the industry. Bartlett’s tenure at NSA was far from his first career stop. Born in 1931, Bartlett attended and graduated from the United States Military Academy at West Point in 1953 with a bachelor of science in engineering. He was commissioned as a second lieutenant in the U.S. Army, serving in the U.S. Army Corps of Engineers as an officer in Korea and throughout the United States. After retiring in 1957 as a captain, Bartlett joined Bethlehem Steel Co. as an engineer and labor relations specialist. His career took a unique turn when he became secretary of highways for Pennsylvania and chairman of the state’s highway commission from 1967 to 1970, steering the development of the Keystone State’s extensive highway network. Later, Bartlett served L.B. Smith Inc. as an executive vice president, where he remained committed to highway advocacy through the Pennsylvania Highway Information Association (PHIA), which he served as president. Bartlett received PHIA’s Transportation Advocate of the Year Award, the organization’s top honor, in 1986 as he transitioned into the next phase of his career at NSA.